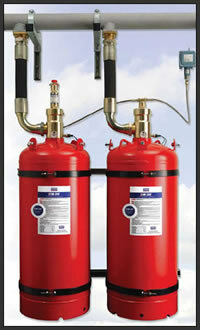 FM-200 systems are known worldwide for providing fast, clean and safe fire suppression solutions. People are the main asset of any business, and their protection is paramount. The FM-200 fire extinguishing system is proven safe for use in occupied, protected areas. FM-200 works by removing heat from a fire so that combustion cannot be sustained, its unique characteristics also prevent re-ignition. FM-200 does not remove the oxygen level to a point where it is unsafe for occupants to remain in the room. Following a fire, the gas may be dispersed through natural ventilation, which is made possible as FM-200 does not have any toxic side effects and because it contains neither bromine nor chlorine, it has no detrimental effect on the earth’s ozone layer. The gas is discharged through a piping network into the protected area, where it is applied to extinguish the fire. FM-200 extinguishing agent is electronically non-conductive and non-corrosive, It leaves no oily residue or deposits to damage software, data files or communications equipment, therefore the clean-up time and costs after discharge are minimal. FM-200 fire extinguishing agent is stored in cylinders as a liquid, pressurised with nitrogen it requires only a small storage space. In order to optimise the performance of any fire suppression system, it is essential that service and maintenance should be carried out by a competent engineer in accordance with the relevant standards, this includes F Gas trained engineers for any work carried out on FM-200 fire extinguishing systems. Automatic Protection Limited are able to offer a full a “24/7” maintenance and call out facility as well as in house integrity testing. We can also service and maintain the detection content of the protected area, aspirating systems and leak detection, this allows us to ensure that all of the related equipment within the protected area - detection, cylinders, solenoids etc. are serviced, operate as intended and are left in good working order. British Standards recommend that the systems are serviced twice per annum with a room integrity test (where applicable) carried out once per annum. A full service report is given after each visit, this will highlight any aspect of the system that will be due for service exchange e.g. cylinders reaching 10 years old and requiring hydrostatic testing. This will allow companies to plan for this and allow for the additional costs within their budgets.